T-Mobile is trying really hard to be different. After spending years at the bottom of the big four carriers, the company hired CEO John Legere to turn things around. As he has pointed out in all of his hilariously candid monologues, the wireless industry makes no sense. It’s ridiculously complicated and none of the companies put customers before profits. He even unveiled new plans that were designed to be simple and easy to understand. Unfortunately, after only half a year, T-Mobile’s plans now operate very differently than AT&T, Sprint, or Verizon’s, but they’re far from simple. After today’s Jump! plans announcement, we’re finding it difficult to explain how they work at all. The more you dig into the numbers, the more you see the hidden costs. The Jump! plan is a clever name for an old idea: phone insurance. 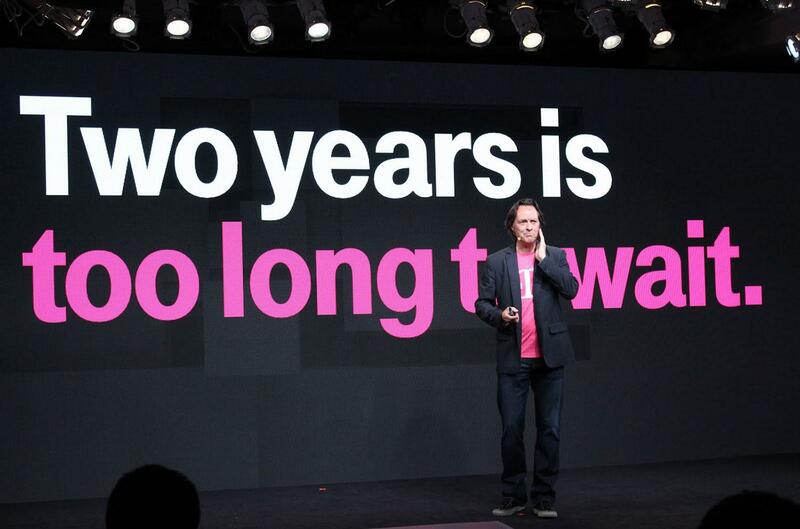 Today, Legere decided to reinvent the subsidized phone … something he just eliminated a few months ago. The gimmick: instead of getting one new phone every two years, T-Mobile will offer you four. Here’s the idea: Basically, instead of buying, say, an Xperia Z, T-Mobile wants you to both buy it and rent it. First, you spend$50 to $70 a months on a Value Plan. (There are three options – unless you want a family plan, then things get more complicated.) Then you pay for your phone. T-Mobile charges $100 up front, then $20 a month for 24 months ($25 if you don’t have great credit). Finally, within 14 days of purchase, you can sign up for the Jump! program, which costs another $10 a month. After you’ve paid in to the program for six months ($60), you can buy two phones every 12 months, each for a subsidized price of $100. When you first hear that you can get four cheap phones in two years, it sounds great, but the math doesn’t add up in your favor. Here’s what you’re really paying. You’re “saving” about $300, but it’s not actually savings, because you don’t actually own the phone. To get your next phone, you have to give your first phone back to T-Mobile. If you accidentally crack the screen, get it wet, or damage it in any other way, you will pay more than $100 for your next phone (probably a lot more). We can forgive Legere and T-Mobile for not knowing exactly how to explain this innovative new service plan ideas, but for an “uncarrier” that rails on competitors for not being honest, it’s deceptive. The Jump! plan is a clever name for an old idea: phone insurance. Every carrier tries to sell you a $10 monthly fee for insurance. T-Mobile has just wrapped its new phone insurance plan in a glitzy marketing gimmick. If you bought a Galaxy S4 and tried to sell it six months later, you could make more than $300 off of it. Worst case, you would break even. The Galaxy S3 is a year old and most eBay entries cost between $250 and $350 today. If I chose to only switch phones once a year, under this plan I’d lose even more money. T-Mobile’s plan reminds me of Best Buy’s infamous Buy Back program. Never to be topped, Best Buy’s program had far less upsides. But the idea is the same. You’re still going to spend a lot of money switching phones every six months. Really, you’re paying T-Mobile for doing the legwork of selling your used phone for you. And if you don’t upgrade your phone every six months, you’re going to end up just about paying full price anyway. Argue about the annoyance of being locked into a two-year contract all you want, or how silly and expensive it is, but the shared data plans on AT&T and Verizon are quickly becoming easier to understand than T-Mobile’s Value Plans and Jump! plans. As someone who switches phones all the time, I’m tempted by this plan, but I’m essentially paying an extra $120 a year for the convenience of swapping my phone (and paying) for a new one. T-Mobile, it’s fine to come up with new ideas, and it’s great that you’ve eliminated two-year contracts, but nothing about this program is cheap. It’s only good for people who feel compelled to spend at least $300 every six months to get a new phone. In other words, it’s a plan built for a few lazy geeks, like me. For everyone else, it’s a plan that will sound good, but end up costing them a lot of extra money. But hey, maybe that’s what we all want. If we can’t go more than six months without buying a new phone, maybe we don’t care about money.